Complete the final and best part of your PADI Open Water Certification in the beautiful and tropical islands of the Bahamas. Here, the diving is some of the best on the globe with endless amazing dive sites ranging from rich coral reef gardens or mysterious shipwrecks that serve as “artificial reefs” to a wide array of marine species. With the PADI Open Water Referral Course, you will get to complete your four check-out dives out of the tropical paradise that is Nassau Bahamas! When you book the Open Water Referral Course, you should have the first two portions of your certification course completed. That includes the classroom session (which can be done online directly through PADI or at your local dive shop) and the pool session (which can be done with a PADI-certified instructor at your local dive shop). Once you have those two parts of the certification completed, all you have left is the actual scuba diving! The final part of your certification course, the four “check-out” dives, is what you complete with us when you are booking the Open Water Referral. You will be going on your four check-out dives with our team of expertly trained and professional PADI-certified dive instructors. We work only with the best - a dedicated and passionate team of local scuba divers who not only adore scuba diving but love teaching it! There is nothing quite like seeing someone after their very first dive. Scuba diving in the Bahamas is something that has to be actually experienced in order to know what the hype is all about. 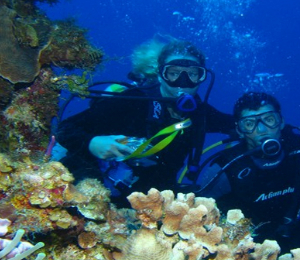 On your four check-out dives, you will be heading to a variety of dive sites including wreck and reef dives. You will be guided by your instructor the whole time. And once you have completed all four dives, you will be officially certified! Your PADI Open Water Certification will allow you to dive at dive destinations all over the world! While still in Nassau, however, you are welcome to join us for even more dives including our famous Bahamas Lost Blue Hole Dive, the exciting Bahamas Shark Dive, or even our Ocean Wall Dive! Q. What dives will I be doing while completing this certification? A. Day 1 is afternoon reef diving and day 2 is the morning dive to the specified dive location for that day (wreck, wall, blue hole, etc). I have been to the Bahamas many times, but Nassau PADI Open Water Referral Course is one of my favorite trips! It includes everything that everyone should do here. As a Bahamas veteran, I can say only the best about this experience!